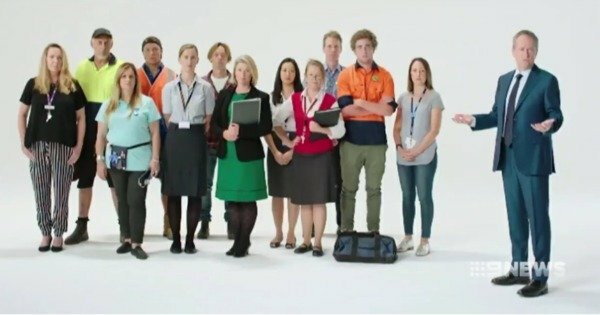 Bill Shorten pledges to review white Labor ad amidst backlash. Bill Shorten to review 'white' Labor ad after if causes controversy. A controversial Labor advertising campaign which has caused a race storm was not approved by the party’s national executive. The campaign features Labor leader Bill Shorten standing next to a group overwhelmingly comprising white Australians. The theme of the campaign is “Employ Australians First”. Labor frontbencher Anthony Albanese said he had not seen the ad before it aired on the Nine Network on Sunday night. “Clearly it was dropped to Channel Nine to be shown last night .. I’m a member of the ALP national executive, I can assure you I hadn’t seen it,” he told reporters in Canberra on Monday. “I think the ad’s a shocker and it should never have been produced and it should never have been shown,” he added. Mr Shorten earlier told reporters he did not believe the ad was racist and it was important the issue of visas for overseas workers was highlighted, but would speak to the Labor party about it. He later tweeted the criticism was a “fair cop”. “A bad oversight that won’t happen again,” he wrote. Mr Albanese said he understood the ad had been withdrawn. “I think anyone who sees it will know exactly what is wrong with it,” he said. Greens senator Sarah Hanson-Young said the ad was “subtle as a sledge-hammer”. As subtle as a sledge hammer. “Honestly, what are Labor thinking? This is awful, just awful,” she tweeted. The race issue was given a kick along with One Nation’s success in last year’s federal election and Pauline Hanson’s demand for a ban on Muslims. Multicultural Affairs Minister Zed Seselja said the ad was a throwback to Labor’s white Australia policy from 50 years ago. “It’s untenable for it to continue,” he told Sky News. Meanwhile, Twitter users were scathing in their criticism of the ad. Just saw Labor&apos;s Australia First ad. I didn&apos;t realise we had so much diversity. Caucasians with blonde hair, brown hair, even red hair! @swearyanthony Life long Labor supporter and not happy with the ad. Pull your finger out Bill.